It is believed that if the brother and the sister take holy dip together in Yamuna on Bhai Dooj day then they would get rid of Yama Lok troubles. This year, Bhai Dooj was observed on November 5, Tuesday. 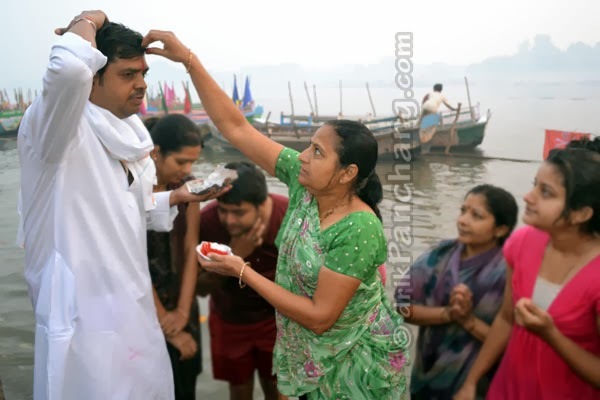 On the significant day of Bhai Dooj, which is observed on Kartik Shukla Dwitiya as per Hindu almanac, thousands of brothers and sisters took holy dip at Vishram Ghat of Mathura. According to legends, Yamuna the daughter of the Surya Dev after getting cursed reached Mathura after wondering at different places. Goddess Yamuna took rest at Mathura and the place where she rested got famous as Vishram Ghat. Lord Yamaraj who is the son of Surya Dev and the elder brother of Goddess Yamuna came to Vishram Ghat to meet His sister. It is believed that it was an emotive meeting for Lord Yama and Goddess Yamuna. Goddess Yamuna did auspicious Tika to Lord Yama and in return Lord Yama asked Her to make any wish which He can fulfill. Goddess Yamuna asked that anyone who takes dip in my water at our meeting place would never go to Yama Lok. Since then brothers and sisters take bath together every year on the auspicious day of Kartik Dwitiya. After bath sisters do Tika on the forehead of their brothers. After this brothers and sisters visit Yamuna Maharani and Dharmaraj temple at Vishram Ghat and offer Puja, clothes and various Shringar items.